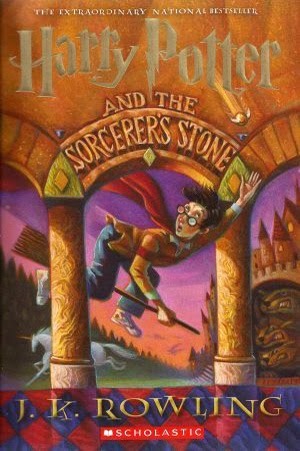 I was in college when I first picked up the Harry Potter series and read through the sixth book one summer while working the front desk at a crazy boring job. The seventh book hadn't been released yet, and by the time it came out, I had moved on to other things. Somehow I was just never motivated to finish them and got the idea in my mind that it was because they just weren't that great. I'd been thinking of a reread for a while and decided to give it a shot when my friend Andrea at We Still Read decided to read them for the first time. My first experience with Jim Dale as an audiobook narrator was for The Emerald Atlas, and I loved his voice, so I decided I'd do audio this time. I'm going to be honest, even though I'm sure Rowling fans will lose their minds when I say this: I didn't even notice the writing. I was so very into the story and the characters and what would happen next that I noticed absolutely nothing about the writing style. Which is exactly what I wanted from the series and I don't think says anything bad about Rowling. It's a plot-driven book. The world building is amazing. And that's about all I can think of to say as far as quality of writing goes. Now THIS is where I get to start raving. Head over heels. I couldn't get enough. I vaguely remembered the plot, but not enough to keep me from wondering what would happen next. And I absolutely fell in love with Harry, Ron, Hermione, Hargrid, Dumbledore, Neville, etc, etc, etc. I'm definitely hooked on the series again and will be finishing up as fast as I can get the audiobooks from the library. I think it definitely says something that there are STILL hold lines for the entire series. Also, I found myself inventing housework in order to keep listening. That's how much I was loving it. Jim Dale. The absolute best ever. Nothing else can be said, but that he's amazing and I would listen to him read a grocery list. Yes, I agree with what you said. To be honest, the plot is really attractive and impressive to us all. I like it very much. I have also some good news to tell you about Harry Potter cosplay costumes which I hear from the website-skycostume.com. Here are the news. Danny Radcliffe, the leading role in Harry Porter's will be in the TV screen showing his face in public again. The second season of "a young doctor's notes" series co starred by him and the "advertising madman" Jo Hamm will be launched on the Sky Arts station on November, the 21th. "Harry Potter" and "advertising madman" with this strange combination will attack again. Share book reviews and ratings with Julie (julie37619), and even join a book club on Goodreads.